2 Wires 65QJD1 21 055 KW 240V 60Hz. 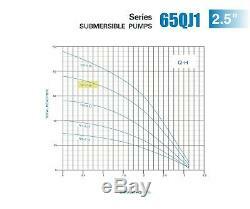 This pump is for 220-240V single phase, 60 Hz! Main Features & Technical Specifications. 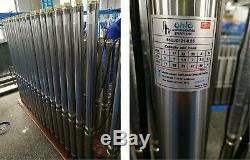 2-1/2 deep well submersible pump, 3/4 HP. 240V , 6.9 Amps (full load current), 21 stage, 1 NPT discharge. Fits well casing with 3 inside diameter or larger. For 5" casing, you can use our 4" pump and for 3" well casing you can use either this pump or our our 2" pump. Max head at shut off condition (zero flow) is about 250 Ft.
Max flow of this pump is about 13.5 GPM and it takes place at about 13 Ft of head. If you are pumping to a pressurized tank, you need to add 139 Ft to the water depth in your well to figure out your operating point on the curve. Almost all components of this pump are made of 316 or 304 stainless steel except the impellers (made of POM which stands for Polyoxmethylene), the diffusers (made of PC which stands for Polycarbonate) and both suction and discharge heads which are made of bronze. Motor coil is 100% copper. Thank you for visiting my listings. The item "2-WIRE 4.5 GPM@225 FT 2.5 SUBMERSIBLE 1- PHASE 240V 60Hz 3/4 HP DEEP. WELL PUMP" is in sale since Saturday, February 2, 2019. This item is in the category "Home & Garden\Home Improvement\Plumbing & Fixtures\Pumps".